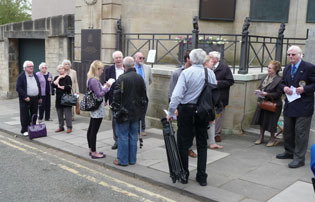 A BBC film unit was in Bath, filming for a documentary on the Baedeker Raids, to be broadcast in October 2011. The cameraman (centre picture with camera tripod) and a researcher (just visible over his right shoulder) were given permission to record the event and use it in their documentary if they wished. 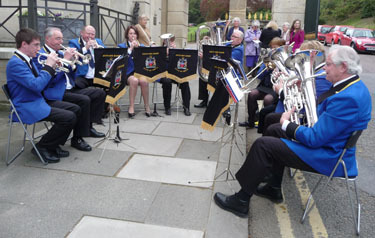 The Bath Spa Band played while everyone took their positions. Harry Hemming welcomed everybody, and informed them that this year the memories were from the Larkhall and Snow Hill areas. 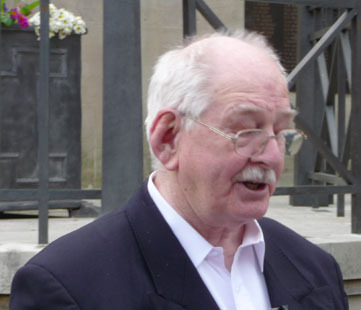 He told the story of Mr Rhymes (the father of the late Councillor Rhymes) who during a raid prayed in Larkhall Square that nobody would be killed in Larkhall, and despite a number of bombs falling there during the blitz, nobody was. He said that the memories which he would relate later in the service would therefore be about Snow Hill. Kay Barrett recited a passage from The Bible: Isaiah Chapter 2 Verses 2-4.
" 2: And it shall come to pass in the last days, that the mountain of the LORD's house shall be established in the top of the mountains, and shall be exalted above the hills; and all nations shall flow unto it. 3: And many people shall go and say, 'Come ye, and let us go up to the mountain of the LORD, to the house of the God of Jacob; and he will teach us of his ways, and we will walk in his paths': for out of Zion shall go forth the law, and the word of the LORD from Jerusalem. 4: And he shall judge among the nations, and shall rebuke many people: and they shall beat their swords into ploughshares, and their spears into pruning hooks: nation shall not lift up sword against nation, neither shall they learn war any more." 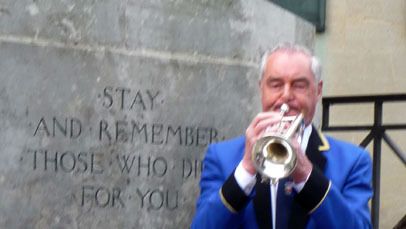 A soloist from the Bath Spa Band played The Last Post. Prayers were offered by Edgar Evans: for the peace that Isaiah wished for; for the victims of man's inhumanity to man; for those in the trouble spots of the world; and for those suffering problems in our own country. Prayers were then offered for the victims of the Bath Blitz and their families and friends who mourn them. This led on to The Lord's Prayer recited by all. Then followed 1 minute's silence for private contemplation. 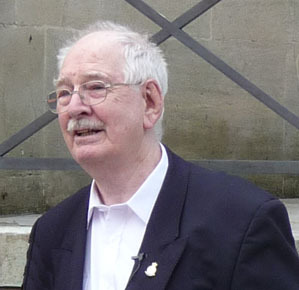 Harry told of two families who lived in Snow Hill: the Pearson family and their neighbours the Baily family. The Pearson family lived at No 21 Snow Hill. What happened to the Pearsons has now been put on its own memories page. The second story, of the Baily family was a slightly shortened summary of Eileen's story, which is already on this website. 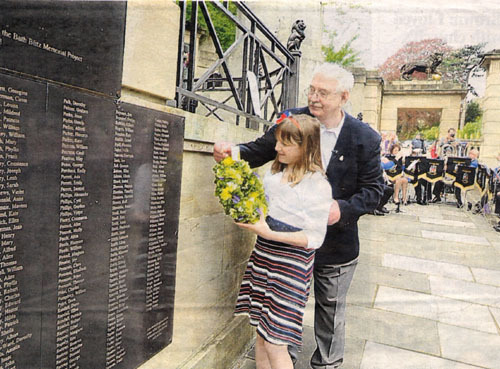 Laying the Wreath, by Lucy Hemming. 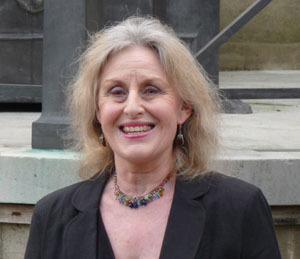 Lucy Hemming is the granddaughter of Harry Hemming, and a direct descendant of the members of the Baily family who featured in Harry's recollections. 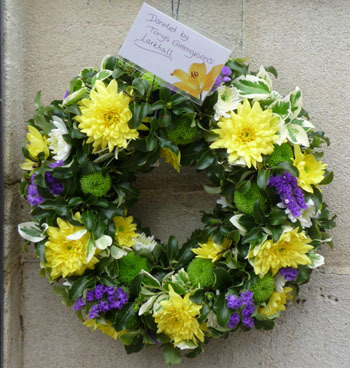 The Wreath, donated by Tonys of Larkhall. The message of remembrance on the wreath label is enlarged here. Click here for information about the plans for the 2012 ceremony. People have gathered to remember the victims of the Bath Blitz nearly seven decades ago. This year the annual Bath Blitz Memorial Project service concentrated on the stories of two families in the Snow Hill area, who were caught up in the raids which left more than 400 dead. 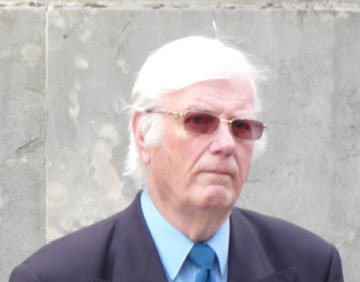 Harry Hemming, from Oldfield Park, told the poignant story of his wife Eileen's night of terror. She lost almost her entire family during the bombings on April27, 1942. The family sheltered in their cellar when they heard the air raid sirens. When the bomb hit the house, Eileen's father Albert, mother Lillian and sister Doris were killed instantly while she and brother Leonard were badly injured. Edward had not a scratch on him, but the cellar filled with water from a burst pipe, and he drowned. Eileen was rescued five hours later, with two broken arms, a broken pelvis and a crushed chest. Eileen died in 1996, and Harry read her story on her behalf, with their three sons. A minute's silence was held at the Royal Victoria Park memorial on Sunday to remember the 417 people who lost their lives. 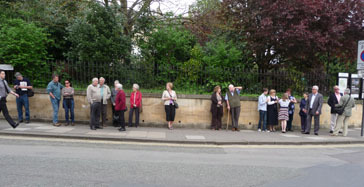 People gathered at Royal Victoria Park to remember the victims of the Bath Blitz nearly seven decades ago. This year the annual Bath Blitz Memorial Project service concentrated on the stories of two families in Snow Hill caught up in the raids which left more than 400 dead. His wife Eileen lost almost her entire family during the bombings on Monday April 27, 1942. The family who lived at 23 Snow Hill, sheltered in their cellar when they heard the air raid sirens sound. Father Albert sat in one chair reading a paper, and mother Lillian sat in another knitting, while their children Leonard, Eileen, and Edward, and Leonard's wife Doris looked on. When the bomb hit the house, Albert, Lillian and Doris were killed instantly while Leonard and Eileen were badly injured. Edward had not a scratch on him, but the cellar filled with water from a burst pipe, and he drowned. Eileen was rescued five hours later, with two broken arms, a broken pelvis and a crushed chest. Leonard was also rescued, and after along stay in hospital, he rejoined the army. Eileen died in 1996, and Harry read her story on her behalf, accompanied by their three sons. Harry said: 'Eileen was traumatised by the events of that fateful night. She lost almost her entire family. "It means a lot to me to be here to tell her story and remember those who lost their lives." 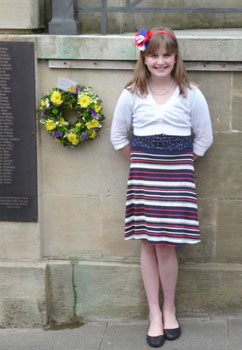 His 11-year-old granddaughter Lucy a pupil at St Julian's Primary School in Wellow, placed a wreath on the war memorial. The other story told concerned the Pearson family also from Snow Hill. On the night Mr Pearson was out working with one of his sons, while his wife was at home with their younger boy. Mr Pearson sent his son home to check on the rest of the family and as he entered the house, it was bombed in a direct hit. All three were killed instantly. A minute's silence was held to remember all 417 people who lost their lives, and The Bath Spa Band played Nimrod by Elgar. Lorna Williams, from Larkhall, came to pay her respects. She said: "It is important that we remember the people who sadly lost their lives on that night. I wanted to take part in the minute's silence as a mark of respect." Her daughter Sophie, 19, added: "I think people of my generation should be aware of the Bath Blitz and how many people were killed. Sadly I don't think enough are."